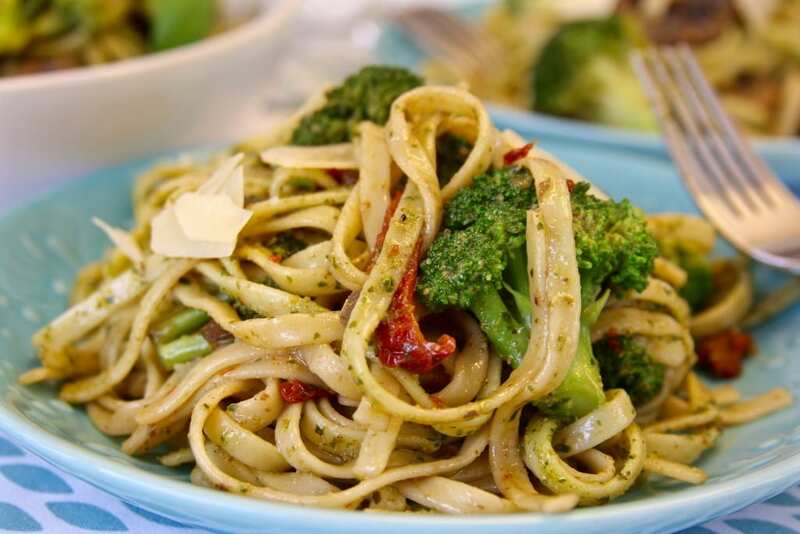 A crisp glass of wine, lacy noodles, aromatic pesto and savory sun dried tomatoes. Sounds like a perfect dinner to me. One of the best parts of the evening is relaxing with with loved ones and sharing a great meal. What is even better is when the meal is homemade and it is incredibly easy to make. 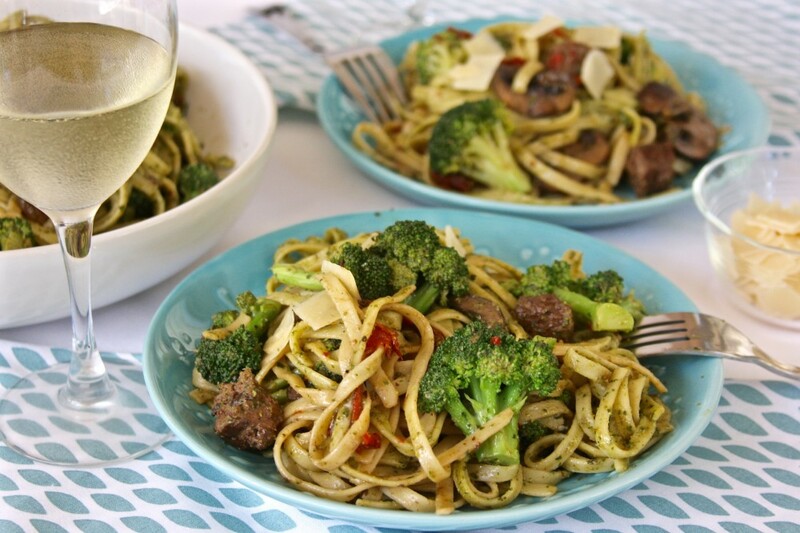 This Roman Pesto Pasta is made with organic grass-fed Italian Beef Sausage and my comforting Toasted Walnut Pesto. 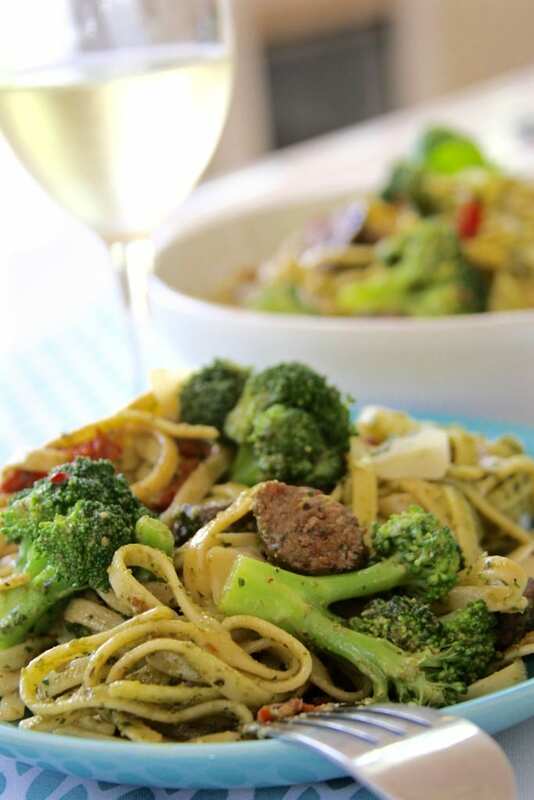 Pull up a chair and chilled glass of wine because you are going to want to make this easy and oh so yummy dinner tonight. You will also learn a little about a great little Southern California farm. Anyone who has kept up with my posts and recipes knows that I am huge about organic ingredients. Outside of the benefits of less pesticides for the body to have to process, I feel going organic reaps huge benefits for the environment. On that note I am so excited to share with you a small family farm named Primal Pastures located in Temecula, Ca. They offer organic pasture raised meats and eggs, in addition to locally caught seafood and honey. 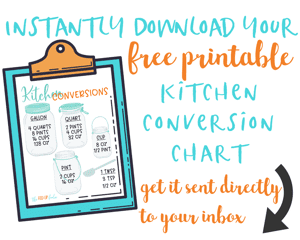 I love that they ship their products and I was very impressed with how quickly it arrived. The packaging is completely recyclable and very easy to break down. I highly recommend reading through their website to become familiar with what makes their products different. Also if you are not sure what all the fuss is over our meat supply here in the U.S., see here for a very thorough and informative article from the Union of Concerned Scientists. If you have tried grass-fed beef in the past you know that it is a little different from conventionally raised beef. It tends to be a little gamier, has less fat and cooks much faster. I have really grown to love the taste of grass-fed beef but I do have to admit it was challenging in the beginning. 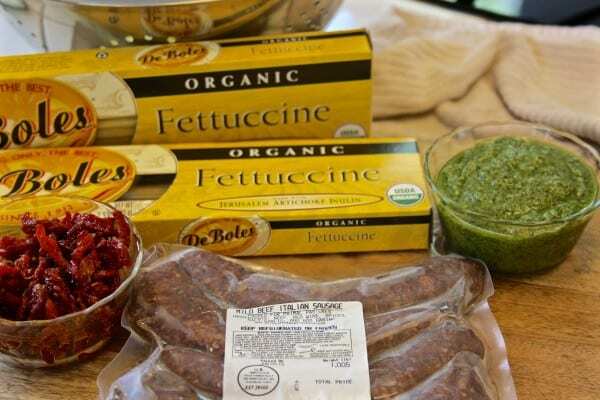 Primal Pastures Italian Beef Sausage is a perfect place to start if you have never tried grass-fed beef, as it has a mild taste. The secret is to cook the meat on a lower flame-low and slow. 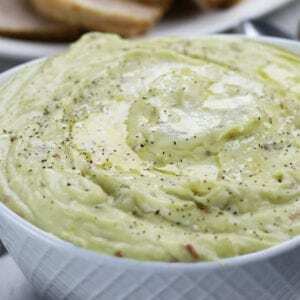 It has a much lower fat content, as you will read in the articles above, and has higher nutritional levels. One other product that made this dish unique is the De Boles Organic Fettuccine noodles made with Jerusalem Artichoke Inulin. Jerusalem Artichoke Inulin is a prebiotic and may help to lower blood pressure. There are many stores that do carry the noodles now. If you can’t find them near you the good news is you can buy them directly from De Boles. 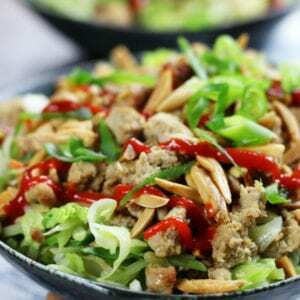 Outside of the comforting savory taste of this dish, I love that it is packed with veggies. 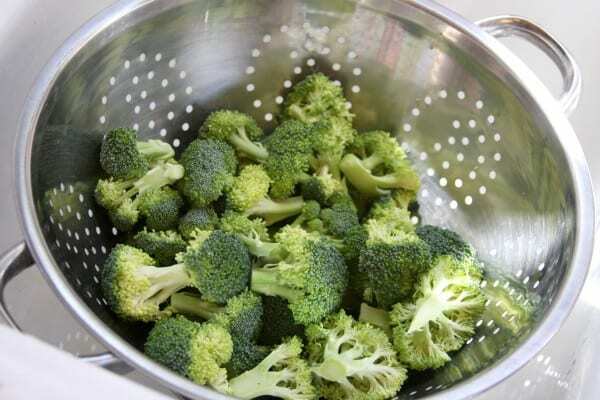 For perfectly cooked broccoli, place the florets in a colander and drain the noodles over the broccoli. 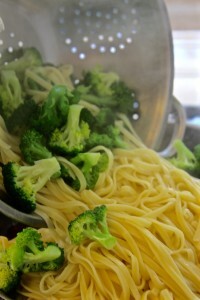 The heat from the noodles draining is very similar to blanching, but so much easier. My Toasted Walnut Pesto gives a wonderful nutty depth that pairs beautifully with the Italian sausage. When you cook this Roman Pesto Pasta, it may feel like a big portion as you are stirring everything together but let me warn you, it will go fast. HMMM… I think I need to go eat now. Enjoy!!! 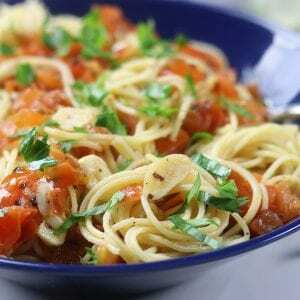 A fast and easy pasta dish loaded with a ton of flavor and veggies. Boil pasta in heavenly salted water following directions on package or until al dente. Clean and cut broccoli into florets. Place in colander. When pasta is done cooking, drain over broccoli. Broccoli will cook slightly by doing this. While water is coming to a boil for pasta, cut onion into small strips. Sauté in a large frying pan in olive oil over medium high flame until semi-soft and translucent. Remove Italian sausage from casing and cut into about 1/2 inch coins. Turn flame down to a medium heat and add sausage. Cook at lower heat until meat is cooked throughly, approximately 8 minutes. Add mushrooms and cook until mushrooms have lost their water and almost done, approximately 6-7 minutes. Add sun-dried tomatoes and wine. Simmer for another 4 minutes. Cover and set aside. Add cooked pasta and broccoli to meat mixture. 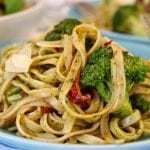 Add pesto, toss gently to cover all noodles with pesto and thoroughly incorporate veggies. This looks amazing! I’m always getting stuck with ‘what to make for dinner.’ This will be on our dinner plates this week! I already have my primal pastures beef sausage. Also, the broccoli tip just changed my life! Haha thank you! I totally understand the ‘what to make for dinner’ blues. I loved Primal Pastures Italian Sausage in this recipe. I am excited to hear how it goes. Pouring the hot noodles over the broccoli was a life changer for me too?. You can also do the same trick with frozen peas for pasta. Thank you for commenting and come back soon!